You can select up to 12 travelers in total. 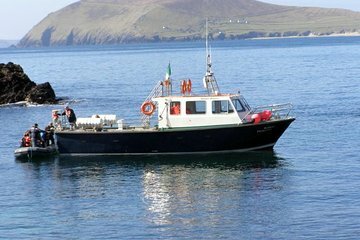 Experience the thrill of observing whales and dolphins on this 4-hour cruise around Dingle Bay. Marvel over the startling coastal scenery as you drive along Ireland’s Wild Atlantic Way, then hop aboard for a memorable cruise around the bay. Glide past Slea Head, the westernmost point of Europe, then cruise out to the Blasket Islands and look out for humpbacks whales, dolphins, seals, basking sharks and puffins. It was a great trip and we saw a whole school of dolphins and a couple whales! Super trip with lots of common dolphins, minke whales, three bottle nose dolphins, a harbour porpoise, some puffins, gannets and a few glimpses of a hump back whale. We set out to see the puffincolony on the rocks, but after a while the crew heard that a humpbackwhale was spotted and we changed directions to that. In the end we didn't see much of it, but that was compensated by all the other species we've seen. We'll have to come back for the puffins! This was a great trip - one of the highlights of our time in Ireland. It's a relatively small boat -- there were only about a total of about 18 passengers on the boat. There's enough seating for everyone and the guide is very knowlegable. We went out on a very nice day sunny! and saw three minke whales and a buch of seals. It was a great day. A few recommendations: bring wine with you - they let you have it on the boat. Dress warm... hats, gloves and jackets. It's always colder on the water than on land. Bring hand santizer as there is a bathroom on the boat, but no soap or sink, really. Still a great trip and well worth it for a relaxing day out on the water. The drive to Dingle from Adare was beautiful, by this time I was used to driving on the wrong side of the road and the round abouts. The boat arrived exactly on time and the captain was there early and visited with all of us on the quay. Once under way, we knew exactly what to expect and what we hoped to see. We saw dolphins, seals, and multitudes of sea birds. But alas, no whales. This was not due to the crew not trying but sometimes nature doesn't go by a schedule. The stories and explanations are not to be missed. I cannot recommend this trip enough. The trip was incredible. The marine biologist and zoologist were very friendly and helpful in spotting the wildlife and giving some context to the landmarks. My only gripe is with the description of the trip. On my booking it was noted that water and snacks would be provided amenities but neither were found on the boat. it was a really great tour en we saw a lot of dolhins. There was also a whale, but he didn't show himself a lot. People wehere great, we had some nice snacks en drinks. It's great! We went far beyond the Blaskets and saw many small whales and birds. We got the opportunity to see puffins, seals and the highlight was an orca whale! A wonderful boat ride to Basket Islands. The crew was knowledgeable so be sure to ask them questions! The skipper knew the water and was safe for all!